If you're thinking of trying something different for that special occasion, then it's a good idea to look into a Boston Harbor Odyssey cruise. Whether it's a big event for your company, your anniversary, birthday, or any kind of celebration that calls for something out of the ordinary, then a fancy dinner on a three hour cruise might suit you. With a capacity of 150 people, the Odyssey has multiple decks—an indoor lower deck for dancing and dining, a middle deck with a small dining room, a half-open deck with a covered bar, and an upper deck which is fully open with benches, tables, and chairs. The upper deck is usually the highlight of a cruise, as one gets to enjoy the scenic view of the Boston skyline which is especially magnificent at sundown. For entertainment, there is a live band usually playing jazz on one of the decks, and a DJ playing ordinary, but romantic songs normally heard at weddings. Depending on your package, you can get either multiple course meals or a buffet style set up. The ship is also available for huge events where you can book the entire ship for your group. This is a great option for corporate or other organizational celebrations. According to online reviews, the cruise typically meets one's expectations of what a high-end harbor journey would be like—fancy meals, formally dressed people, a romantic atmosphere, and luxurious ambience. However, there are some exceptions with the Odyssey. Mostly, it’s good to come into the cruise well-informed and not to one's expectations too high. Firstly, while the dining rooms are fancy and the food is set up on your plate luxuriously, the food has generally not been rated 5-stars. If you came out to have an exquisite dining experience, this is not the venue to go to. The food has been rated hit-or-miss, with some dishes being really great and others feeling like the result of a culinary freshman's failed attempt at a contest piece. Still, the overall dining experience is great, given the cruise setting and the ambience. Secondly, the attire—while the website states to come in a formal attire, such as a jacket for men and a cocktail dress for women, the crew officials are not strict about this. This means people wearing shorts and a baseball cap may be near you or dining with you in the same room. This sort of downgrades the overall "luxury cruise" experience that is being sold as part of the package. Another minor thing worth mentioning is the passage of the cruise underneath the path of airplanes getting reading to land at Logan Airport—loud, momentary, aircraft engines on the open deck that can sometimes ruin a great romantic moment. The service has been described as great—the members of the wait staff are very helpful and efficient, with about one available for every three guests. The staff has a way of making sure that your every need is covered, without being there with you too much to invade your privacy. They are very knowledgeable of the different attractions that the cruise passes by. One online review stated that the cruise has "2.5-star food, with a 5-star view and service." The cruise passes through the Historic Boston Harbor, from Castle Island to George’s Island, then east to the Boston Light on Little Brewster Island, and back north to Charlestown Naval Yard before returning to Rowe's Wharf. The route gives the passengers an unrivaled scenic view of the South Station Tower, John Hancock Tower, Federal Reserve Bank Building, Prudential Tower, One Boston Place and many more. 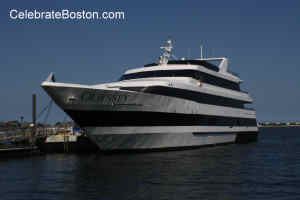 All in all, the Odyssey cruise is a great experience if you have the budget for it. Expect to enjoy the company of your loved ones in a pleasantly unusual experience—being out in the sea, seeing Boston from a different perspective, with romantic music, great service, and average food. Walking Directions: Exit the station and walk north up Atlantic Avenue to Rowe's Wharf. The building has a tall beautiful arch. Walk underneath and Odyssey is berthed on the right.